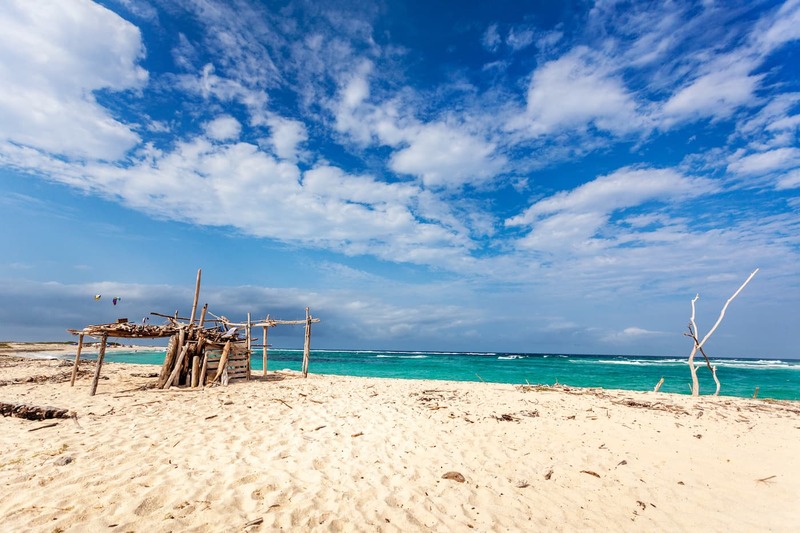 A makeshift driftwood shelter on Aruba’s Boca Grandi beach. It’s on the east side of the island and kite surfing is a favorite pastime here. Just north of Bachelors Beach you will find the beach of Boca Grandi, a true paradise for experienced kitesurfers and windsurfers. Boca Grandi is surrounded by approximately 750 meters of white sand beach that is not very wide. Further down the beach stretches for about 780 meters to the north and gradually changes into Grapefield Beach where the beach is much wider. Constant trade winds from the east and fairly big waves make this beach not very suitable for swimming or snorkeling. It is potentially dangerous unless the winds are low and the waves are calm. When kitesurfing or windsurfing is not your cup of tea, just watching the surfers challenging the elements of nature is also a great thing to do. Also you can spend your time by exploring the beach and discover what the ocean brings to land everyday. Boca Grandi is a very popular place among beachcombers! As Boca Grandi offers no amenities it is important to bring your own stuff to have your visit well-prepared. Make sure you bring a hat or a cap, a parasol, UV sunglasses and some high-SPF tanning lotion because shelter from sunlight is hard to find. Maybe a pair of beach shoes is handy too, to protect your feet from the rocks that are scattered across the beach. From Oranjestad make sure you enter Lloyd G. Smith Blvd and follow directions south to the Queen Beatrix Airport and then Savaneta and eventually to San Nicolas South. Continue following directions to Sero Colorado. From here on you proceed further east to Boca Grandi. A bright red giant anker marks the entrance to Boca Grandi that you cannot miss! From the hotel zone the trip to Boca Grandi takes about 30 minutes.